How to crop MKV and preview it and capture the screen when editing it? What’s the significance of video crop and converting it to MKV? MKV is a format of “combination” and “encapsulation”, in other words, it is a container format. Advantages: It accommodates a variety of different types of coding of video, audio and subtitle stream, including the exclusive formats for RealMedia and QuickTime. MKV is a revolutionary video format, and it is becoming an all-purpose container and one of the most important video formats. Disadvantages: Unlike AVI, which is backgrounded by Microsoft, MKV has no back-office support. And at present, it is basically widely used online. Generally the internet means “ to share”, as a popular video format online, we may encounter MKV everywhere, and that’s one reason why it is important to crop MKV files. 1. How to crop MKV. 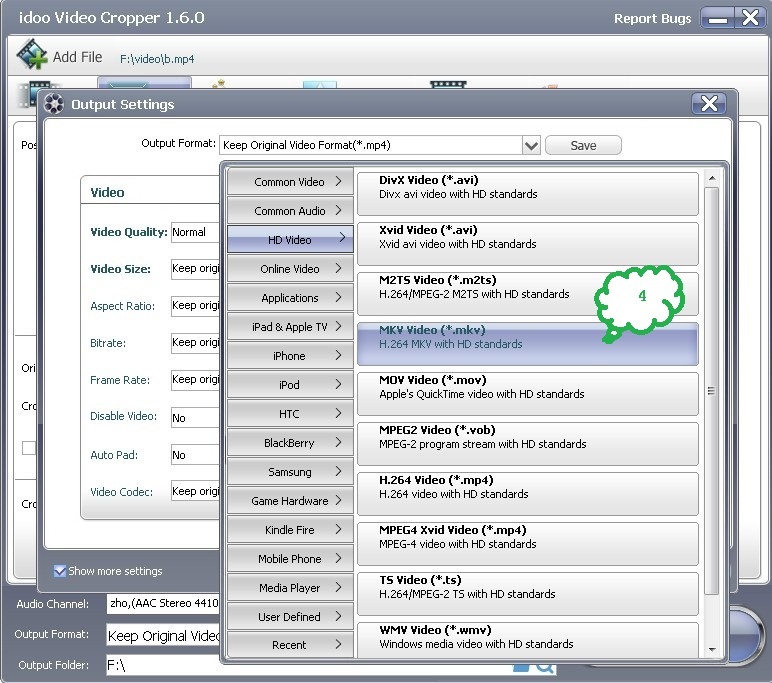 Download idoo Video Editor, and crop the MKV file in “Cropper” function. 2. How to convert cropped video into MKV file? With the integrated function of cropper and format conversion, you can easily crop the video and convert it into MKV files in one step. During the course of video crop, it is more efficient to preview it, or you may want to capture the screen, and luckily the cropper function of idoo Video Editor enables you to do so easily. The following part will show you how to preview the video and capture the screen, and how to convert the cropped video into MKV file. In the interface of “Cropper”, you may click Tag1 to preview the video and click Tag2 to capture the screen. By clicking Tag3, you may also select the image format and save path from the list. 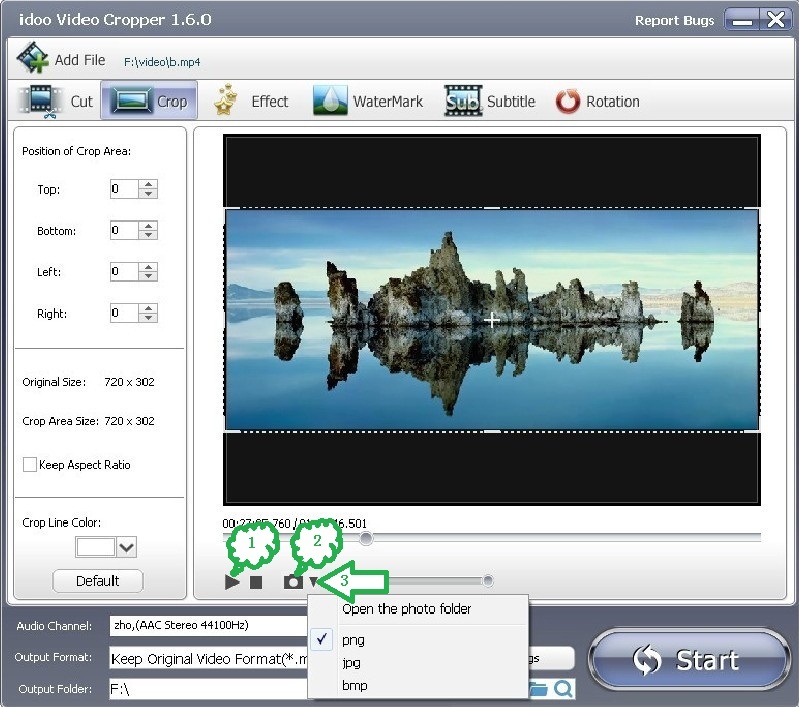 Click “Output Settings” in the interface of “Cropper”, and select “MKV Video” (Tag4) in the dialog box. Then click “Start” to begin converting your video into MKV files. You can just click “Start” to get the video cropped or add more effects to the video. For more detailed operations, please refer to relative information in our sites. How to crop MKV and preview it and capture the screen when editing it? How to get AVI cropped and check the format of the audio in the AVI file? How to crop MP4 video? The easiest video cropper for mac-- idoo video editor pro How to crop video for YouTube and convert it into YouTube format? How to solve various problems we encountered when crop movie by movie cropper? Why idoo video editor is better than online video cropper and free video cropper? What's a good, easy-to-use video cropping software? Is there any way to quickly crop the ends of a large video file? How to crop a video? How to cut WMV video? How to cut MP4 video? How to cut MOV files? How to cut video clips? How to cut split video for YouTube? How to cut and effect video? How to easily cut AVI video? How to cut 3GP? How to cut video and join after effects on Windows? How to join video files clips together for Windows pc? How to easily split video files into parts for YouTube...? How to simple crop video for YouTube...? How to effect video background clip with...? How to add subtitles to movie MP4 AVI YouTube...?